Kristy has always been inspired by vintage botanical prints and is passionate about interpreting these iconic symbols of historical illustration. Her botanical paintings are decidedly muted in color palette and at times a bit modern in styling. With the added touch of The Hand Painted Moment (link to section of “Meet”) on each invitation, The Botanical Collection sings with edited detail and dreamy textures. Kristy’s Botanical Watercolor Wedding Invitations take their cues from classics while adding her own updated, youthful spin. Edited shapes, curious mingling of color, watercolor spatter and punchy palettes all give this collection a distinct voice. 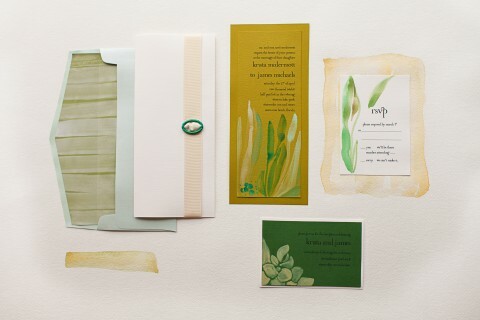 See more Botanical Wedding Invitation Inspiration!